Time Magazine recently released two top ten lists. They’ve named the top ten best and worst fictional mothers. You can check out the lists at the Time website. I especially I enjoyed their description of Whistler’s Mother. 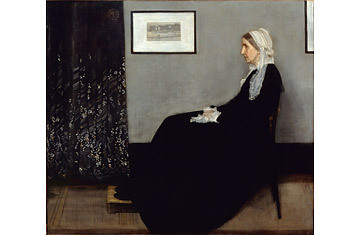 We don’t really know if artist James McNeill Whistler’s mother was a good one or not. It doesn’t matter. All we really need to know is that she looks like a good mother and she’s looked that way since 1871 when her son put her on canvas. Whistler’s mother seems like she just sat down after killing, plucking and roasting a turkey with all the fixings. The monochromatic patina might seem severe, but we like to see it as a reflection of order, just as we see her silhouette profile as one of unbending strength. Whistler’s mother doesn’t seem like the huggy type and she definitely won’t take any lip, but that’s okay because she comes off as someone who gets the job done and makes many delicious baked goods, to boot. That’s not what you see in Whistler’s mother? Not a problem: she’s whatever mother you want her to be.